The unstoppable forward momentum of man’s imagination, art and progress. In 1994, three French explorers uncovered a cave that had been closed off for millennia as the result of an ancient rock slide. As if the beautiful natural wonders of calcite formations and perfectly preserved animals bones of long extinct creatures weren’t enough…this particular cavern in the limestone, Chauvet Cave, was also home to the oldest prehistoric cave paintings ever discovered. Scientists estimate some of the paintings date back over 30,000 years to a time when most of France was covered by an ice sheet and man roamed the harsh terrain along with Neanderthals, wooly mammoths and rhinos, horses, cave bears and lions. As unforgiving and calamitous as their environment may have been, these early humans still found time to dream and create art that would survive 30,000 years of unstoppable forward momentum. This is the focus of Werner Herzog’s gloriously transfixing and typically odd little film, Cave of Forgotten Dreams. If you are a fan of Herzog, his particularly lucid and sometimes loony narration will be an absolute delight. Herzog has always been drawn to the misfit and extremist dreamer – people so dedicated to their vision or project that their madness can just as easily bring about their demise as it can a resounding success. Here he attempts to place the explorers, scientists and artists he interviews and the anonymous Paleolithic painters in a similar mold – people driven by their dreams and boundless imaginations. When he interviews so-called experts including a former carnival worker turned cave mapper and a perfumist who uses his supernatural sense of smell to detect air drafts coming up from hidden openings to caves, it’s pure Herzogian madness of the most sincere and wondrous kind. Those not familiar with the director’s tendencies or previous works may tire of his heavily German-accented voice-over and grow befuddled by his cavalcade of weird new friends who wax poetically and sometimes nonsensically about the paintings. Regardless of your feelings towards Herzog’s presentation, no one can deny the overwhelming sense of awe one feels when viewing the paintings. Man left his mark in Chauvet Cave in depictions ranging from a simple circular smattering of handprints to a complex panel of animals seemingly in motion, running forward in sharp fluid lines and carefully detailed features, marching in a fury towards the future. The film’s greatest strengths lie in the fifteen minutes towards the end when the talking and speculation ceases and Herzog’s silent camera lingers longingly in slowly moving panning shots and close-ups on each of the striking panels while religious-like music plays. This serves as striking companion piece to both the closing moments of his Encounters at the End of the World where his camera traveled beneath the ice and the sea into a previously unknown world of epic splendor and his Wagner-themed depiction of Jonathan Harker approaching Count Dracula’s castle in Nosferatu. It almost takes your breath away until Herzog jumps to a coda where he ponders over albino alligators and doppelgängers – just go with it, okay? Despite himself, Herzog is smart enough to know the paintings are best left to speak for themselves. Animals long extinct. People long ago dead. Civilizations changed many times over. But in Chauvet Cave time stands not still but instead moves forward, taking the soul of prehistoric man into infinity and beyond through the art he left behind. Surely this must be the birthplace of the idea of immortality. 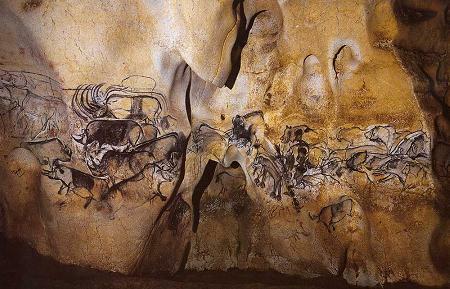 This entry was posted in Art, Art-house Cinema, History, Inspiration, Movie Reviews, Movies and tagged Anthropology, Archaeology, Cave of Forgotten Dreams, Cave Paintings, Chauvet Cave, Documentaries, France, Paleolithic Man, Werner Herzog. ← Scratch Anthology Volume 3 is Here! Herzog has thus mounted a long and crazy career directing both documentaries and narrative dramas. Here’s my ranking of what I’ve seen, and I invite you to do the same. I would love to see this film. Thanks for the reminder! Although I have heard a lot about Herzog, strangely, I’ve never watched any of his “creations”. Your review of this documentary incites my curiosity. I’ll think I’ll watch it. In the meanwhile, what do you suggest I should see to get introduced to Herzog? Rescue Dawn? Since you said it’s more accessible in your other review? Thank you Dave. That sounds good. I’ll watch it in that order then. And even leave you a message once I watch them. And yes, originals in the director’s native tongue are almost always more effective than the re-made/dubbed English versions. So, I’ll stick on to the German version. Fantastic review David of CAVE OF FORGOTTEN DREAMS, a documentary I have extremely high regard for. The subject matter couldn’t miss, and Herzog, as you note, is smart enough to let these wonderments speak for themselves. Even the talking head conversations for the most part were fascinating. My ratings for many of Herzog’s films are close to yours! FOLLOW UP – Just watched Every Man for Himself (aka The Enigma of Kasper Hauser) the other day. Classic Herzog, though while I found many moments incredibly lucid and affecting, there were also some parts that slowed down the whole film. I would probably give it a 7.5 or 8 out of 10. Cave of Forgotten Dreams has been on my shortlist of films to see for a while now, but I ran into the same problem you did. For some reason, no one wants to see a documentary about ancient cave paintings. Your review does make the film sound like a must-see. Will try to catch a screening before it leaves my local arthouse theater. I can see it now: “Cave of Forgotten Tweets.” I do sometimes wonder how future historians will analyze digital information. Things don’t really exist in hard copy. What would there be for archaeologists to discover? Anyway, unrelated. But yes, I do plan on seeing the film!